Happy Bloggers Challenge Friday! This week I gave the players the theme - Alter It, it's always fun to see what they come up with to alter. My DH has been after me for quite a few weeks to change the stamped art I have framed in my Stamp Room. The three frames had summer images and have been up for a few years, so I decided to swap them out for some fall images. I still have some of these frames left over in my alterable bin - bought them at the Target Dollar Spot a few years back, and they are the perfect size to fit on the small long wall in my Stamp Room (photo on left). Maple Leaf : #1 Memento Dandelion, #2 Memento Cantaloupe, #3 Memento Desert Sand, #4 Memento Cocoa. 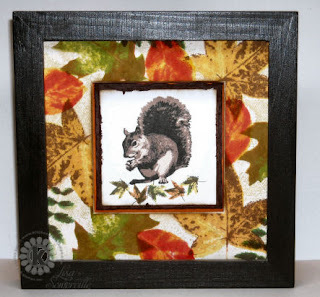 The other images used on this piece are the 3 Step Autumn Squirrel stamped on White card stock (#3 Memento Black, #2 Memento Cocoa, #1 Memento Desert Sand), the small leaves are from Multi Step Owl and Autumn Moon (#1 Memento Dandelion, Memento Tangelo, #2 Memento Cottage Ivy, Memento Cocoa). The panel behind the stamped image is done with the Torn Frames Technique. The Multi Step Tree is stamped on White card stock as follows: #1 Memento Dandelion, #2 Memento Pear Tart, #3 Memento Bamboo Leaves, #4 Memento Cocoa. Flowers: #3 Memento Cottage Ivy, #2 Memento Pear Tart, #4 Memento Rhubarb, #5 Memento Rhubarb, #1 Memento Dandelion. Basket: #1 Memento Desert Sand, #2 Memento Cocoa, #3 Memento Cocoa, #4 Memento Black. 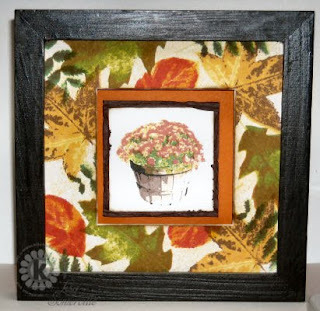 The Chocolate Panel behind the image is done with the Torn Frames Technique, then layered on a piece of Pumpkin Pie. Thanks so much for stopping by - I hope you enjoyed my Altered projects! Looking for more Altered Inspiration, click on the Bloggers Challenge Logo on my sidebar to see what the other Challenger players created this week. If you'd like to play along with this weeks challenge, just leave me a direct link in the comments section - I'd love to see what you altered. What a great collection of wall art you have here!! I love those frames too, wish we had a Target around here so I can make some great finds!!! Perfect addition to any room. Luvin' those leaves behind the different images, sweet! These are beautiful, Lisa! I love fall and your pictures and color combos capture it perfectly! Lisa, your husband can't complain any more. These are stunning pieces of art. Love the colors and those images are amazing. GORGEOUS! You truly captured the beauty of the fall season! I still have some of those frames sitting around, too! These are awesome, Lisa! YOU so have mastered those stamps. Just finally took a peek at my Take Ten mag too and saw your fun page of creations. Congrats to you! Wow! - These are just fabulous. I love the background you created behind your images. What a wonderful Home Decor project. I would display these for sure. These are all gorgeous and really showcase your stamping talent. What perfect decorations for your stamp room. As a customer, I'd walk in and think, "I'm in the right place!" These are WONDERFUL---Love the colors you chose. Great job! That is definitely a wall of art, those frames with the scenery inside are awesome, loving the colors of it all! These are beautiful Lisa!! Love the colors and all the leaves!! They would look perfect on any wall!! AMAZING!!!! Lisa, these are just gorgeous!!!! Lisa, these are absolutely wonderful! My husband is such a squirrel fanatic- the top one would be perfect for him! I love the outside border as well. Great job with those stamps! wow, these are fabulous. I bet those look great on your wall. Look like you bought them not made them. I think I have some of those frames in my studio, but alas--I do not have any of those beautiful realistic stamps. Beautiful fall decor, Lisa! I can't wait to try those big leaf images myself. These are super cute and I bet they look great in your stamp room! These are really beautiful, Lisa!!! They will look great on your wall, I'm sure!!! 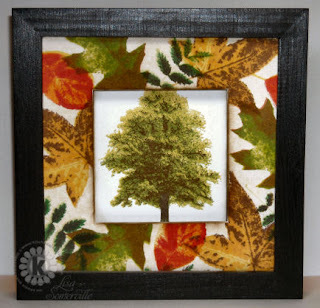 What a beautiful job you did with these stamps and frames! Simply stunning!